You’d think Aussie’s PR folks might try to balance the publicity around the menagerie of deadly creatures here (spiders, snakes, jellyfish and the like), with some marketing about all the incredible birds. My jaw-dropped when I looked out the living room window my first day and saw what appeared to be a pet-store escape. The yard and trees were “chocka” with (full of) sulpher [sic] crested cockatoos! And on my first fleet-feet tour of the neighborhood, these awesome rainbow colored birds kept sweeping across my path. Rosellas! I’ve seen dozens since! 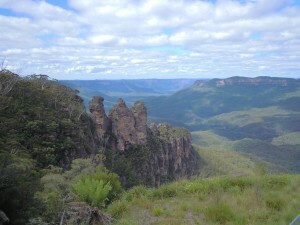 The infamous Three Sisters – I’m off for a hike later this week! Who knows if the avian offerings would be as wonderful if I wasn’t currently residing in the Blue Mountains about 90 minutes out of Sydney. Another slip in the marketing department, in my opinion, is the lack of publicity for places beyond the beaches and infamous outback. 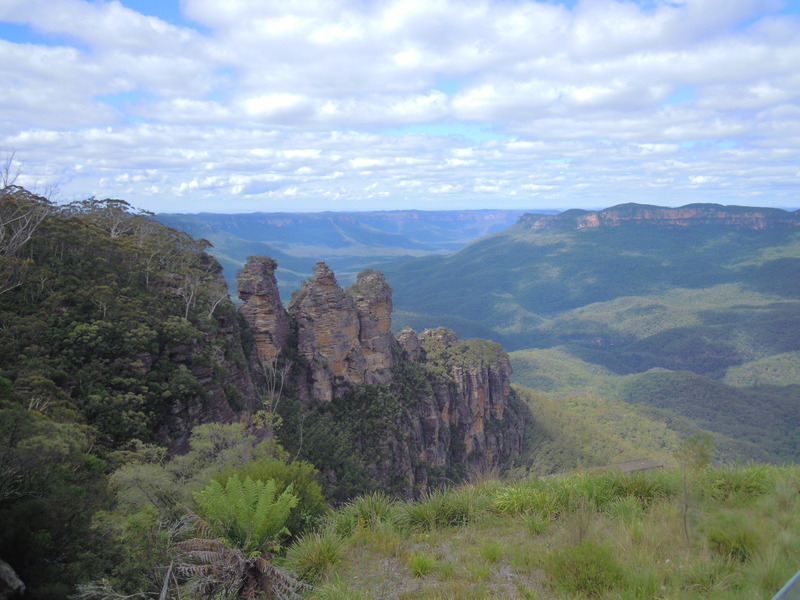 The forests full of eucalyptus (gum) trees, rocky outcrops, and mist-shrouded valleys are magic to me. It’s thanks to a fantastic woman named Gabrielle that 1) I’m here, 2) I’ve learned anything at all about birds, 3) I’m treated to several occasions per day that warrant a deep belly-laugh. Gabrielle (she says it GABE-riel) is one of the most lively people I’ve ever had the pleasure of knowing. She’s coming up on her 70th birthday, but bounces about as if she’s 8 years old. She’s delightfully verbacious, laughs often, has a wonderfully positive attitude, and I never have trouble hearing her! Most of her sentences, in typical Australian style, end with some sort of quasi-question – you see, you know, isn’t it… As in, “The flour goes just here, you see.” Or, “It’s getting too hot now, isn’t it!” Or, “I’m trying to get fit, you know.” I love it! I also adore that she admonishes and talks to herself in the third person: “What are you doing now, Gaberielle? You must get going, Gabrielle. Calm down, Gabrielle: you don’t have to go as fast as the song is going.” Love, love, love! Pierrick and Gabrielle – we made German pretzels with the Thermo-mix and they were incredible! She provides almost-constant commentary on everything from the history of the area, the speed of other cars on the road, who lives in what house and what each person is like, facts about the birds and plants, the desirability of the current temperature, where each street leads, etc. It’s clear there is much pleasure in the telling, and I enjoy knowing what’s on a person’s mind. That way you always know where you stand. And given my bottomless curiosity, I’d say we’re a match made in heaven! Her mud-straw home, in addition to her obvious awesomeness and location in the Blue Mountains, was a big draw card for me. I love seeing and participating in alternative building and am hoping to help finish the exterior of the final two walls while I’m here. The whole house is a fusion of eco-modern. On the modern side, her hi-tech, German Kitchen Aide (called a Thermo-mix) turns out some pretty incredible food. With a $2,000 price tag, it better! I do give the operator plenty of credit. 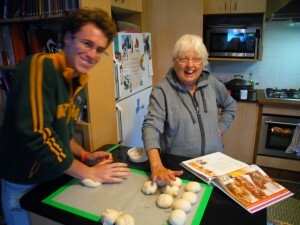 In the past three days, she’s produced dough for German pretzels, a fantastic pesto, a wonderful red-bean chocolate cake, a yummy pavlova… Mmmmm! 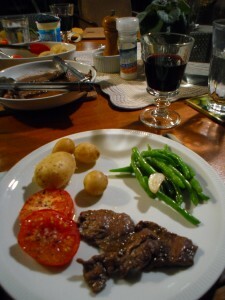 Kangaroo steak, garden beans and slow-roasted tomatoes, local dutch cream potatoes, local wine = happy, happy Jema. She’s also treated me to my first (and second) Kangaroo meat. The night I arrived, delirious from almost 24 hours of travel, we had “Kanga Bangas.” (British-descended folk colloquially call sausages “Bangers.”) About 12 hours ago, we had lovely pan-fried steaks that she had me fillet to about quarter-inch thickness. Kangaroo is “yum!” I grew up eating wild deer, antelope, etc. An uninitiated palate might find it a bit “gamey,” but I enjoyed it immensely! So who is this lady, how do I know her, and where can you get one? You might know that over the past two years I’ve been doing several work exchanges or WWOOFing (Willing Workers – or sometimes World Wide Opportunities – On Organic Farms). The point was to learn as much as possible about farming and to see as many farm sites as possible while also getting to know and be a part of local families where ever we were. “We” was myself and my former partner. Our shared dream was to start a farm of our own – mostly to live sustainably and sell-off the extra to support a country lifestyle. We broke up six months ago, however, so my commitment to studying farming has lessened. Enter HelpX. 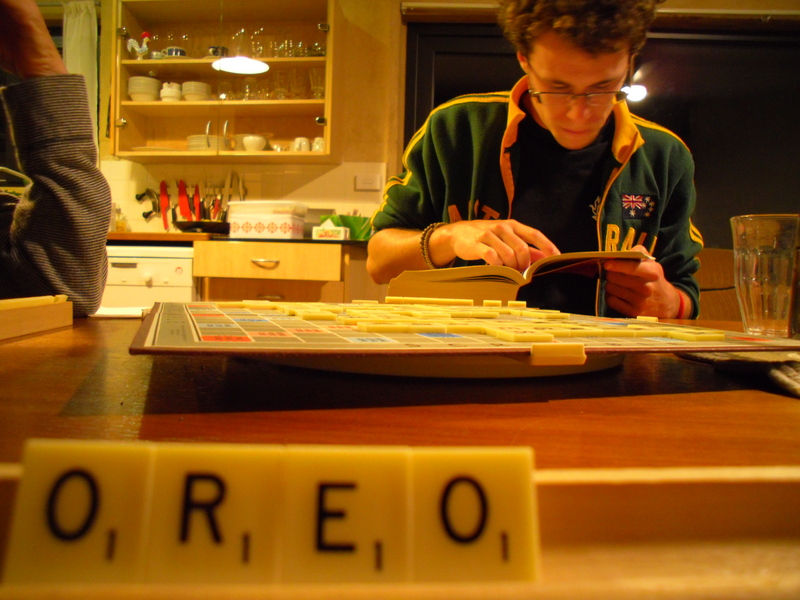 We let Pierrick use a dictionary for his first-ever Scrabble game. He beat us by miles! Much like WWOOFing, there is a website full of profiles offering room and accommodation in exchange for about four hours work per day. 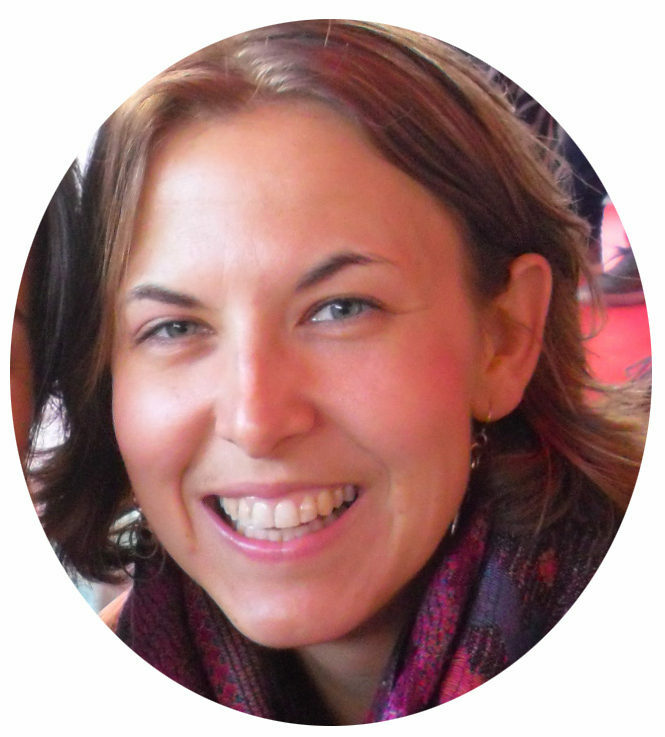 However, HelpX can be anything from cafe work to hotel cleaning to nannying to – yes – farming! And the membership is good for two years and every country in the world, whereas WWOOF memberships are one year and require payment per country and sometimes even per state! As my goal is learning and cultural exchange, you’ll likely not find me HelpXing in a cafe or hotel. There are plenty of wonderful people like Gabrielle looking for folks like me to stack their wood, harvest their basil, carry heavy things, pull their weeds, mulch their flower beds, sew ties on the backs of cushions, organize their filing cabinets, build kiwi trellises, clean their gutters, etc. 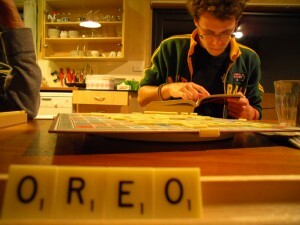 Where the platypus crosses the road, Dr. Pepper in the import aisle, and Pierrick’s first pavlova in this facebook album. JEMA! I heart you! is Gabrielle German?? I’ve heard of these Thermomix machines, my husband tries to explain them to me, I’m still curious. I’ll have to find one and see it next time we go! Just wanted you to know there’s a good song by John Vanderslice called Kookaburra! Oh, and some of your bird photos are “broken” – I’d LOVE to see them! Hi Molly! Gabrielle is very Australian, but the Thermomix is indeed German. They are hugely popular here in Oz. I’ve seen them being demoed at farmers’ markets, two of my five hosts have them, the chef at a culinary event I went to used one… My friend Margaret calls hers “Thermie.” She also tells me they’ve caught on in Canada. Apparently you’re not allowed to own one unless you attend a special training! Anyhooo – tried to fix the photo. Thanks for letting me know! I’ll check out the song!